On my way to a vlog assignment, I took a shortcut through an alley and saw this. Word on the street is that the shop owners who share the wall don’t mind the graffiti (I assume, as long as it’s artful), however there was a cop car pretty much laying in wait behind some bushes about halfway down the alley. If anyone knows the artist(s), I’d like to give her/him full credit. Maybe then I’ll do something more creative with the video, too. 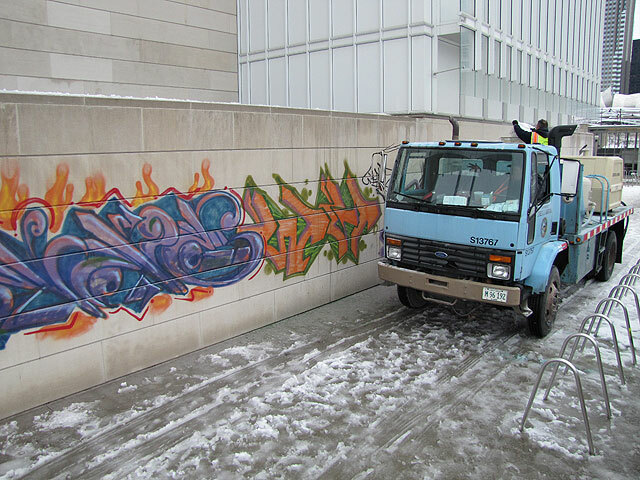 Chicago readers probably already know that the Modern Wing of the AIC was marred by graffiti some days ago – and kudos for the quick response and having it removed as soon as possible. HOWEVER (and this is difficult for me to say without extreme passion or expletive because I was a historian/office manager for a historic masonry preservation firm for eight years), when removing graffiti from historic or otherwise important masonry buildings, sandblasting is the absolute last resort because it permanently damages the weatherproof surface of the masonry and promotes rapid deterioration of structural integrity. You would think that a museum with archives dedicated to architecture would have consulted preservation specialists before going ahead. By the way, consulting a restoration company is not the same thing as consulting a preservationist. If you ask for sandblasting from a restoration contractor, you will get sandblasting. Restoration firms are in the business of giving the customer what they want, not necessarily what they need. And to be fair, the damage done to the Modern Wing is not the contractor’s fault. They did what they were paid to do. Preservationists are who you want to call when this kind of problem comes up. They are trained to understand long term effects of preservation/restoration efforts and are generally semi-detached from the construction industry so are more likely to give objective advice and to lead you to the proper restoration techniques and specialists. Anyway, I do not know who is in charge of these kinds of decisions at the AIC (I suspect it is not the architectural archives), but whoever you are, here is a link to a technical preservation brief on graffiti removal techniques from the National Park Service, Department of the Interior that is considered standard by historic preservation departments and societies. Now, please call a reputable preservationist to ask how to consolidate the masonry to prevent accelerated weathering damage. Sheesh!